That sounded like a title for a love story. But it’s not. Okay, there were “lovers”, but not in the romantic sense. More like a group of people who love one thing, and would stay talking for almost nine hours just talking about that thing. A few months ago, after I started posting more in this blog, I also started to posting in the Filipino groups in Goodreads. I have to admit that I only started posting because I saw Chachic was active, and I was curious with the local group. So I started posting. And posting. And posting. Then I got an invite for the second meet up. I really wasn’t planning to attend because the venue wasn’t where I usually go to. But when I learned that the invites were for selected people only (and there was free lunch)…I can’t not go, right? So I said yes. 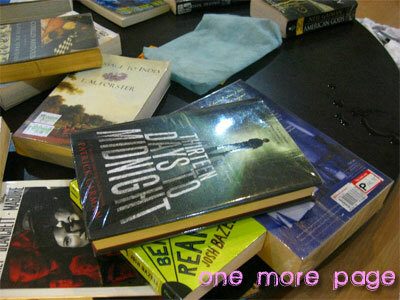 Fast forward to a few weeks later, after lots of excited posts in the Goodreads group, it was time for the meet up. I realized as I made my way to the far away restaurant that I have no idea who these people were, and I’m putting blind faith into the posts I read in Goodreads. I’d have to assume they’re nice people because there wouldn’t be a second meet-up if the first one wasn’t fun and they didn’t get along, right? And besides, how violent can a group of book-lovers be? How many people were fighting for this book again? But I’m getting ahead of myself again. They were really nice people, and I felt at home with them after just a few minutes of talk. They reminded me so much of my Wrimos, only with more passion for books than writing. I mean, the PinoyWrimos obviously love books, too, but whenever we meet, all we talk about are plots, word counts, novels, Chuck Norris and how bad Twilight is. With the Goodreads people (how do we call ourselves? Goodreaders? ), there’s lots of book talk, and…well, discussions on how bad Twilight is. Heh.